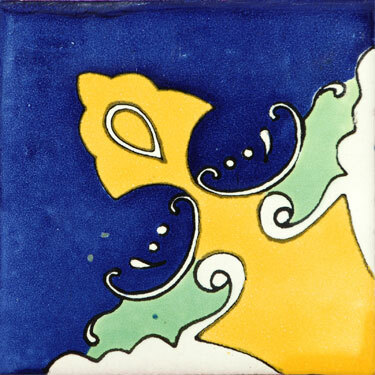 Mexican Tile on Color y Tradicion .com, Mexican Tiles, Talavera Tile, Ceramic Tile, handmade tiles, Mexican Sinks, Mexican Plaques. With this beautiful design on the Medallon Azul Esq Mexican Ceramic Tile you will be able to give life to the place where you want to use them to decorate. We have many years of experience helping you to decorate your house and there is no limit for what you can do with these beautiful Mexican Talavera tiles. Enjoy the colorful and joy that you will be able to express using these spectacular Mexican handmade tiles to decorate your �patio�, kitchen, counter top, staircase, bath tubs or any other place where you would like to use them. We offer a great variety of patterned Mexican ceramic tiles, by selecting this Mexican Talavera tiles, you are not getting the tiles only, you are getting an entire culture and traditions that will allow you to get a beautiful decoration. This mural is made of 16 tiles.